The LM150, which will be released online June 12, is our list of the top revenue-generating firms in the landscape industry. But it isn’t all about numbers and dollar signs. 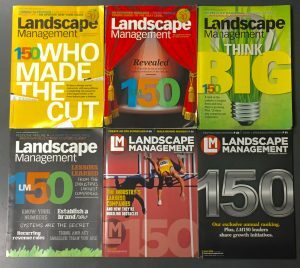 The features that accompany the list are designed to present the ideas and best practices that propelled the top 150 landscape companies to where they are today. While the list is designed to congratulate and document those companies’ achievements, the features are a blueprint for smaller companies trying to grow. In preparation for the 2017 list, we pulled some LM150 stories from previous years. The lessons may be old, but they’re not outdated. The feature stories not only still ring true today, but they tell a story of where the industry has been—and, if history really does repeat itself, where it’s going. Flashback warning: Back in 2011, the industry was just realizing the real impact of the Great Recession. TruGreen topped the list with $1.3 billion in 2010 revenue, but overall, the industry grew by just 3.5 percent from 2009 to 2010—a huge drop from the $7.97 billion increase from 2007 to 2008. The smallest company on the list sat at just $6.8 million. But the industry’s top companies gleaned knowledge from disaster. In the article “Lessons from the Recession,” then-Editor-in-Chief Dan Jacobs wrote about how the recession created a “self-preservation attitude” among many companies. The article is a glimpse into the mindset of landscape company owners who were still unable to see the light at the end of the tunnel. Todd Pugh, CEO and founder of Enviroscapes, described how the collapse of the economy transformed the company. The article describes what landscape executives learned about borrowing money, hiring employees, making money and reevaluating service offerings in the middle of one of the worst economic recessions since the Great Depression. If you can stomach it, that is. With companies still reeling from the recession, 2013 was the first year since 2009 without a billion-dollar company. But in an effort to mimic the resilient spirits of green industry members, we focused on 13 big ideas that firms of any size could implement to boost revenue and profits. While many of these tips have become industry best practices, most companies can still benefit by improving in one—if not all—of these aspects today. One idea that many companies have yet to adopt is No. 10, hiring a full-time recruiter. Sure, this one might sound daunting, but in the 2016 LM Industry Pulse report, finding employees was the No. 1 concern among the companies we surveyed. Plus, today, the industry has much better financial footing than it did at the tail end of the Great Recession. Hiring a recruiter might be one way to overcome a nagging problem. The idea came from Swingle Lawn, Tree & Landscape Care CEO and Owner Tom Tolkacz. While he recognized the additional added cost, he improved his people problem—even if it did create a whole new one. 2014: Lessons learned from the industry’s largest companies—what do you know now that you wish you knew then? They say it’s darkest before the dawn, and the 2014 LM150 list is certainly an example of that. In 2013, the industry’s largest 150 firms grossed a total of $7.6 billion—a 0.2 percent drop and the second lowest total revenue since 2010. The very next year, total revenue jumped up 10 percent to $8.5 billion. But not everything since then has gone in the industry’s favor. When you read some his quotes, years before U.S. counties were banning cosmetic pesticides and the federal government was determining which bodies of water it could regulate, he seems almost prophetic. Last year, the industry continued to go in the right direction. It grew by 10 percent to $9.3 billion. It was also the first year that ValleyCrest and Brickman—now BrightView—reported revenues together. No longer treading water, LM150 leaders were looking forward. So, we covered six company’s growth initiatives. Middleborough, Mass.-based Greenscape (No. 53 in 2016) had just launched a new training program, the Green Way training program. The program, which was designed to promote consistency and standardization, worked in part because of the company’s effort to keep it in the front of employees’ minds. The program relied on weekly check-ins, where employees filled out and shared a one-page sheet per service.